Berea, "The Folk Arts and Crafts Capital of Kentucky." Monday afternoon through Thursday morning. I named it the "Tea Parlor" for this event. Nice to have the tea parlour for your private tea tasting. I like the blue metal welcome sign with the teapot. Looking at your photos is like reliving the wonderful trip all over again! I can hardly wait to get my photos organized and posted on my blog. What wonderful memories you created for us. Raising my teacup in gratitude! I know you all had a wonderful time! Love that teapot sign. Such a special time with tea friends! I am looking forward to more posts about your lovely tea time! 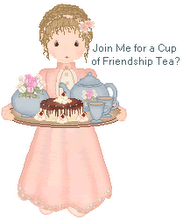 What a memorable gathering of tea friends! Thank you so much for hosting and organizing this very special event. Oh, I am so very glad you took these photos! I got home and found I was so busy *enjoying* the Tea Parlor that I didn't take nearly enough photos of it! What a lovely post from a fabulous gathering. Thanks so much for the postcard! I was flabbergasted...and so touched! It was a fun trip and the "tea parlor" was the perfect spot to sip tea while getting to know these lovely ladies. So happy to see you all there! I wish I could have joined you. Thank you for organizing this, Linda! How fun to see you all together. Love the Tea Parlour too.